I had previously written up how to create a bi-xenon high-beam adapter using a 9005 extension. 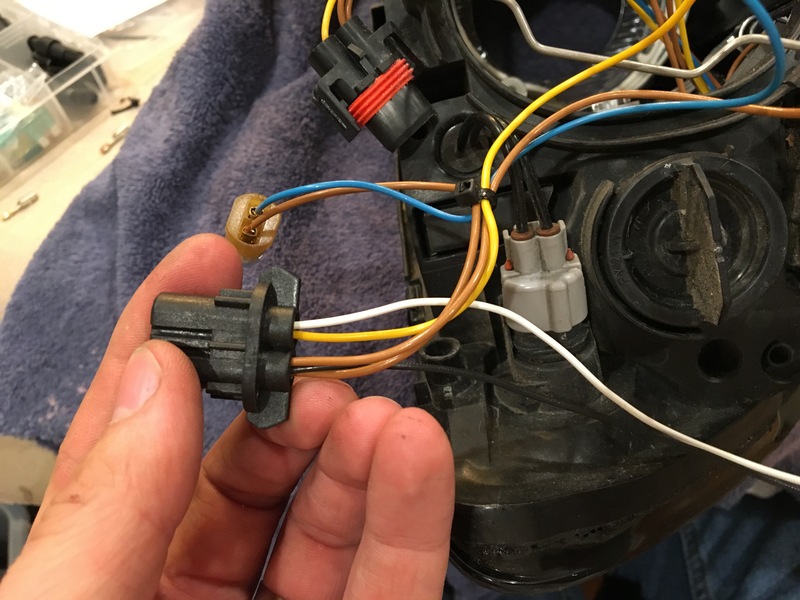 If you don’t mind modifying your headlights permanently, and have long enough wires on the solenoid pigtail (8~10″), with a little work you can mimmic the “factory” solenoid wiring found in the OEM AL bi-xenon headlights that use “Gen 2” (2-wire) (aka “E46”) projectors. 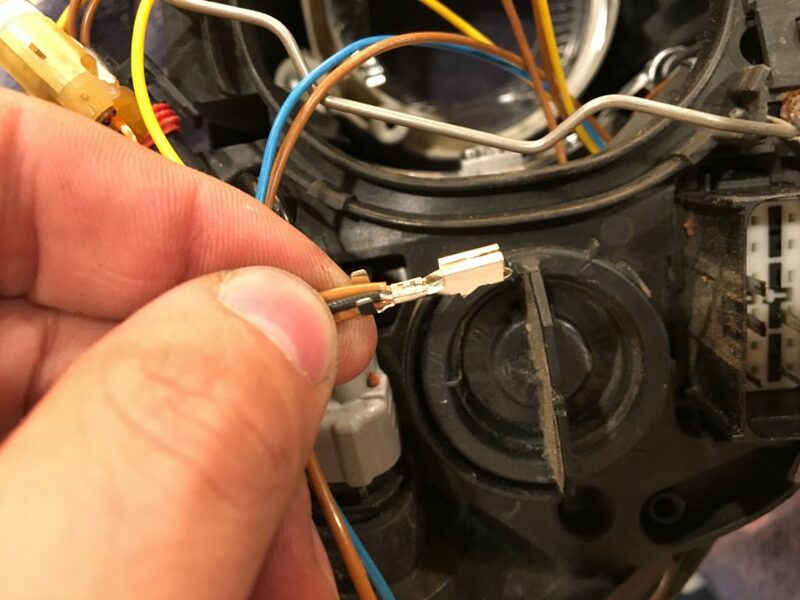 This will also work for replica projectors, but not 3-wire “Gen 1” projectors – those require a solenoid controller. 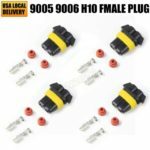 You will need: 9005/9006 female crimp terminals, a molex crimp tool, a wire stripper/crimper, a paper clip, and some zip-ties. 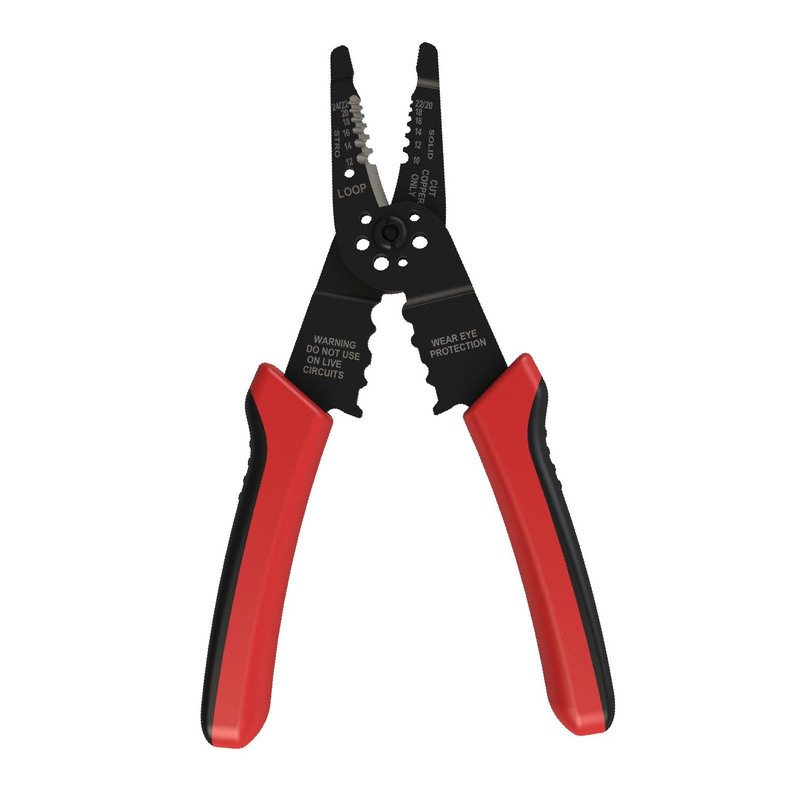 The Molex 63811-1000 crimp tool. Others will work, but this is by far the best. 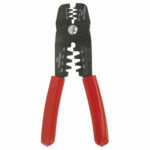 Wire stripper/cutter – any will do, as long as it can handle 20-22AWG stranded. First start by removing the terminals from the OEM 9005 high beam connector, by inserting a paperclip to depress the retaining tab as shown below. 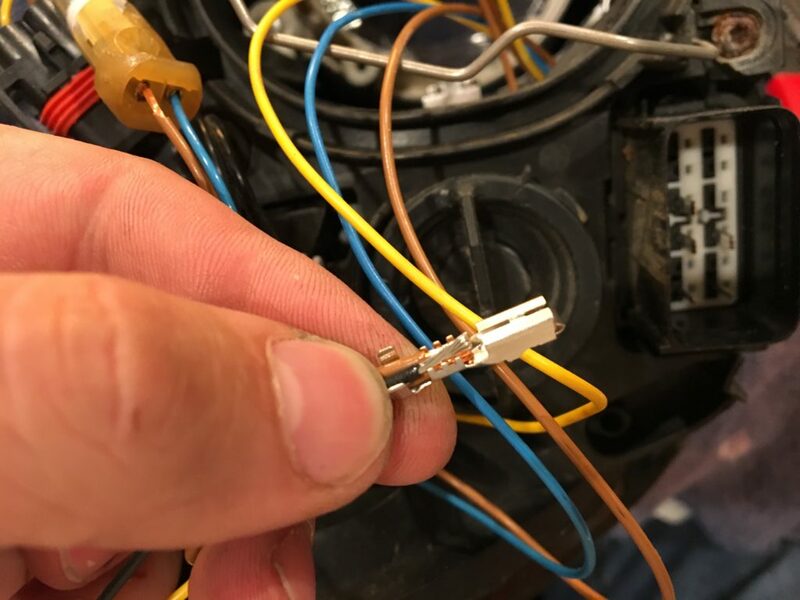 Removing a terminal from the connector housing. 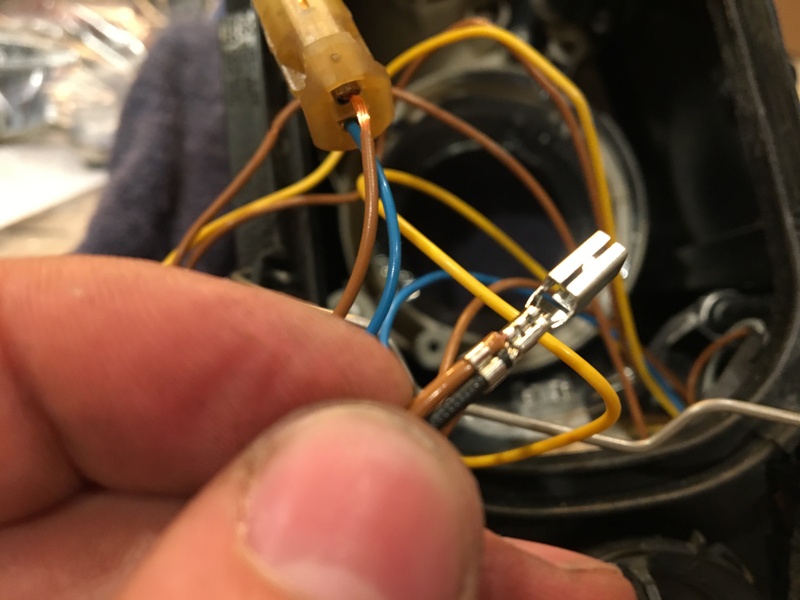 In addition to the two original brown wires, I’ve added a third black wire that runs to the solenoid ground, shown here inserted correctly into the terminal prior to crimping. 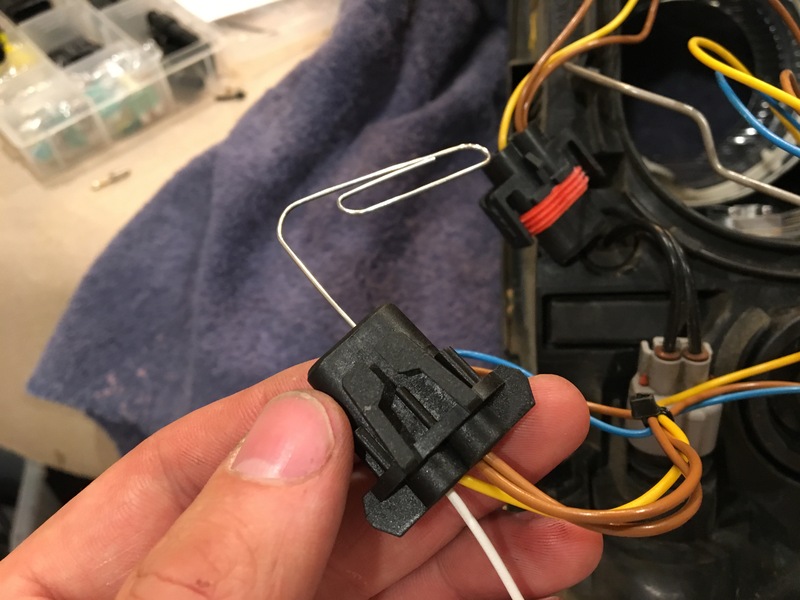 Using a molex-type crimper, ensure that the terminal is securely fastened to the three wires. 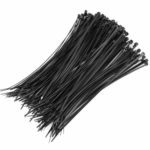 Crimping in progress, showing the correct length of stripped conductor and insulation position. The new ground terminal after being crimped. The same process is repeated on the supply (yellow, +12) side. 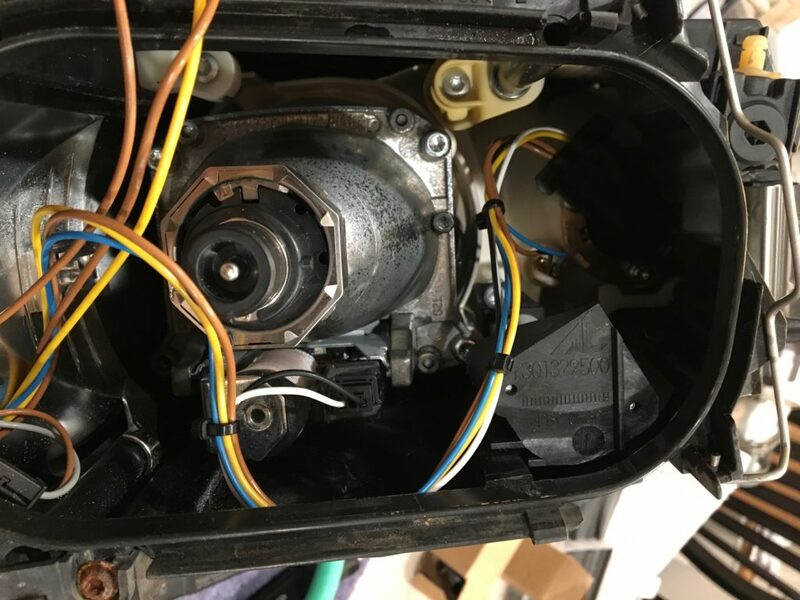 Insert the new terminals into the OEM housing. Retaining tab faces center. Ziptie everything in place, and it looks totally stock! This not only looks nicer, but also frees up some much-needed space inside of the housing.